GKH celebrates its first year in its new office location at 2933 Lititz Pike by hanging a new original painting commissioned by GKH from Lancaster artist Freiman Stoltzfus. 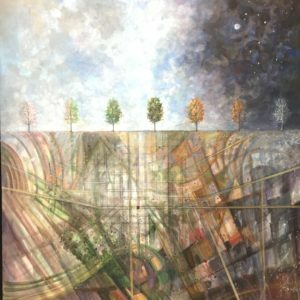 Stoltzfus’s work “Seasons of Lancaster” was painted in acrylic and mixed media on canvas. In “Seasons of Lancaster,” the progression of time is a central theme, as the four seasons of the year pass through seven trees from left to right, and as day becomes night. The seasons are also presented in landscape, via angular patterns inspired by quilts and fields. The City of Lancaster is featured in gridlines, with county roads leading outward. Dwight Yoder and artist Freiman Stoltzfus installing “Seasons of Lancaster” in the GKH reception area. A giclee print, also by Freiman Stoltzfus, hangs in the GKH waiting area. “Grand Wheel of Time” is hand-embellished to create a unique piece, and naturally compliments the original work. Freiman grew up in rural Lancaster County. He maintains a gallery in Lancaster city at 142 North Prince Street.